Reston, Va. — Parabon NanoLabs (Parabon) announced today the company's new Snapshot Facial Reconstruction Service, which produces accurate antemortem composite images of deceased persons from skeletonized remains. 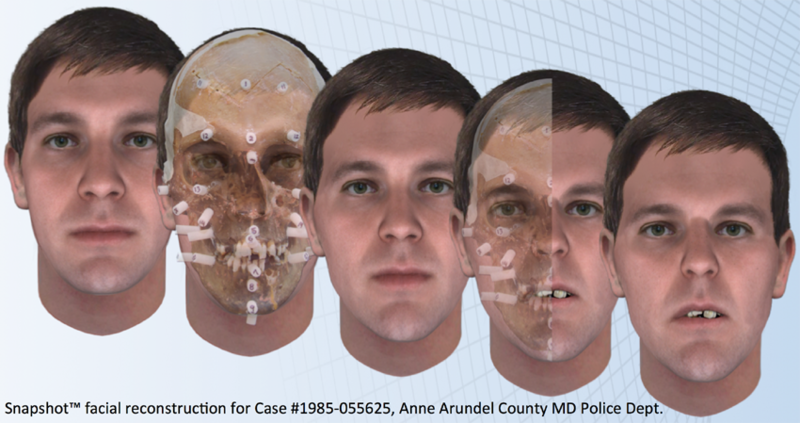 The service combines, for the first time, two complementary methods of estimating appearance from skeletal evidence: DNA phenotyping and forensic facial reconstruction. Snapshot phenotyping algorithms are used to predict a decedent's appearance using DNA extracted from bone. Independently, a traditional facial reconstruction is performed wherein tissue depth markers are physically applied to the decedent's skull, based on DNA-determined ancestry and estimated body weight, to produce a prediction of face shape from cranial morphology. The two predictions are then digitally combined into what Parabon believes are the most fully informed recreations of antemortem appearance ever produced from skeletal remains. 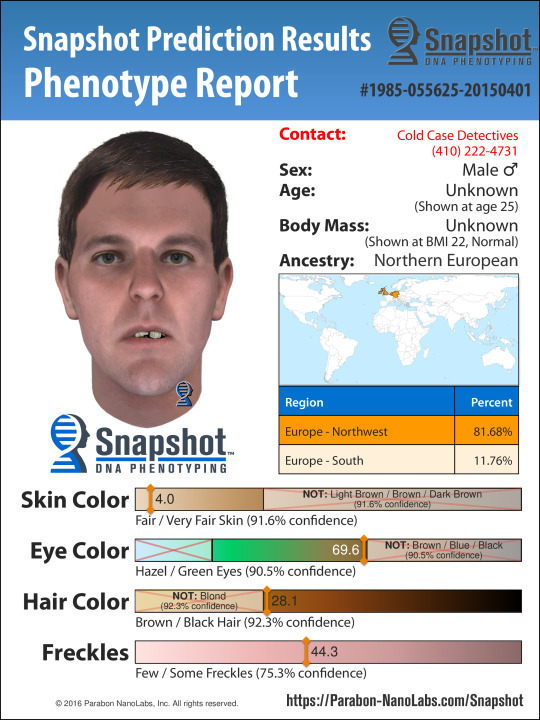 Thom Shaw, Forensic Artist at Parabon, who spearheads the new offering, says the unidentified Anne Arundel victim provides compelling justification for combining the two approaches, noting that DNA phenotyping models are tuned to explain only normal variation in appearance, whereas traditional facial reconstruction lacks critical phenotypic information that is encoded in DNA. "As this case illustrates, enhancing a Snapshot composite with information taken directly from a subject's skull shape offers the potential to capture unusual traits, such as this individual's malocclusion, which would be difficult to predict from DNA alone. Conversely, Snapshot brings phenotype predictions to the facial reconstruction process that are generally not available." He concluded, "We're confident this combined service offering will result in many identifications that simply would not have been possible otherwise."